I'm thinking seriously about selling my low miles manual E36 M3 convertible. It's a bit special having done only 32000 miles (51kms), in great condition and i'm the 4th private owner ( plus 4 or 5 dealers). I gave it a treat recently and had it valeted along with a coating of Feynlab Ceramic paint protection - the paintwork looks almost like new ! ( apart from a few chips and the bottom of the front spoiler, which i may get painted ). I'm interested in what Bimmersport members think it's worth, i'm thinking it's somewhere from $20-30k, maybe towards the higher end - I've seen comment that the E36's are appreciating in value but to what degree ? I've seen the Evo's around $30k plus/minus on TradeMe with twice the mileage, none of which seem to be selling quickly. Well my old Mitsubishi became even more useless than it already was, so i figured it's time to grab a new car and sign up over here 😀. I picked up this NZ new 2003 320D with 120,000kms on it. It had an engine rebuild and a brand new turbo fitted 15,000km ago (all for an ungodly amount of money). The old turbo blew, pumping oil into the engine which messed things up. The crank case breather may have played a part in that, but the old man who used to own it isn't exactly alive anymore, so it's hard to know. The cooling system was done as a part of the rebuild, and a few other common failure points were sorted. I think the only thing i need to do mechanically for now is to have the swirl flaps removed, if they haven't been removed already. So far, It's been an absolute pleasure to drive, especially compared to the car i was coming from. And even with road user charges, i'm saving about $15 a week on fuel, which isn't bad at all. randomly remembered this after seeing Glenn's BBQ posts. I am still going strong havent touched a single cigarette since I quit beginning of May 2018 so 9 months now!! OK, worse reputation might be a bit overboard, but that V8 should be bulletproof and it just isn't, if i am going to have to do an expensive rebuild every 100,000 km then i would much rather spend my money on the V10. keep an eye out for a 135i exhaust to put on there, makes a nice difference! Ive seen one company (penrose somewhere?) offering a N52 tune, claimed something like 300bhp which sounds pretty "optimistic" Interesting to see the results though, nice car. E87 130i - How is it as a daily? I need more info on the steering thing. Its news to me and owning an f20 m135i with electric steering i can confidently say it is totally different to my old 130i lci. But i dont have any experience in a pre lci e87 so need to try one day.. I expect aspects of my job will be done by software/ AI / robots, but i am not worried about being made redundant, i have a very diverse job description that involves everything from answering the phone to maintenance and repairs on machinery, product development, troubleshooting, quality control, driving and more, it would require several very capable and expensive technologies to replace one worker, just doesn't add up. By the time it becomes cost effective i hope to be retired anyway! We bought a 2009 130i for the wife 5 months ago to replace her completely terrible in every single way E90 320i. It's such a fun car, we bloody love it. We took it on a trip to Wellington and I grinned the whole way down and back. The sound of it over 3000 rpm is most arousing. It handles like no 5 series I've ever owned and OMG the sound. Make sure you get the LCI though, get the motorsport, the auto is great, the manual would probably be pretty good too. Ignore anyone that talks about fuel economy, they are boring people. Who cares how much fuel it uses? It's there to burn, burn it. But the wife's long time average is 9.8l/100km, but so what? I think we got to Wellie and back on 7.8l/100km or thereabouts. Except for that part in the Desert Road where it was over 35l/100km. I prefer driving her 130i over my E60 540i by a long, long way, so that's what we use in the weekends. Yeah, the 540 is very comfortable (so comfortable) and quiet and fast and smooth and has all the things (comfort access, adaptive headlights and active steering etc) but it isn't fun like the 130i. The 540 will be replaced in December when its warranty runs out and I can't freakin wait. Buy the 130. There will be no regrets. Apparently, BMW changed the steering to electric with E87 LCI. This took out the need for running the hydraulic pump for steering, hence a slight fuel saving effect. Wasn't that because they were slotted though Dan? 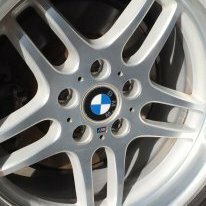 Funnily enough the best rotors I found for the E30 were the cheap chinese one's that Paul Olson brought in - $100 for a pair, nice and soft so plenty of bite from a good hard pad, but not too soft that they fell apart. Bit of a let down being an auto! 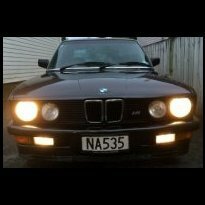 There was a reason they only built 70 odd of them... not many people want to pay more for an auto 328i even if it is a ‘pina. Not classic and not even nice. A late 540i msport is nicer. That's Lani Fogleberg's old car, pretty sure she sold it for $12K back in 2009. Even at 20k those KMs would put any serious investors off.